Preheat grill to medium. Lightly coat chicken breasts with a little drizzle of canola oil and season liberally with Kosher salt and freshly ground black pepper. Grill, with the lid closed, approximately 5-7 minutes, then flip and baste cooked side with bbq sauce. Cook for another 5-7 minutes, or until cooked through and a thermometer inserted into the thickest part of the breast registers 155°F (it will continue to cook while resting). Remove from grill, baste with a bit more bbq sauce, and let rest for 5-10 minutes. Slice chicken breasts into bite-sized pieces. 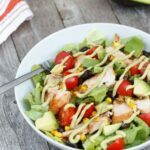 Layer each bowl with lettuce, a hefty spoonful or two of Spicy Southwest Corn and black beans, anywhere between a half to a whole sliced chicken breast (we normally do half), a 1/2 of avocado diced, and a handful of halved tomatoes. Drizzle generously with the Avocado Dressing. In a food processor, purée the avocado, greek yogurt, juice from 1/2 of the lime, and garlic. Drizzle in olive oil and fully combine. Season with Kosher salt and freshly ground black pepper. Taste and add the juice from the other 1/2 lime if needed.